Wits engineers were part of a team that designed an award-winning sensor for social good. 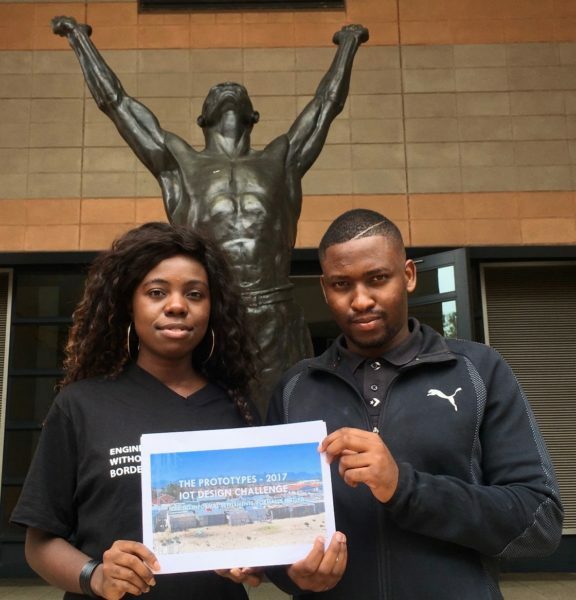 Two Wits engineering students are part of a team whose prototype sensor won first prize at the first Engineers Without Borders (EWB) Internet of Things for Social Good Design Challenge. The team has now partnered with IBM to build their sensor so that it can be installed in informal settlements and change the living conditions of those communities. The leader of the team, Eunice Bohulu, a chemical engineering student and chairperson of EWB-Wits, told Wits Vuvuzela that, “Our team designed a sensor that detects fires, the concentration of pollution, and noise.” She said the noise detection was included as the team assumed that criminals were using noise as cover to commit crimes. “The sensor would be able to detect high volumes of noise and tell people via SMS with the use of the internet that noise was high and issue a warning. If there is a fire or if someone’s house is heating up, people will be notified,” said Bohulu. The team included Khutso Selepe, a second-year mining student, as well as two engineering students from the University of Johannesburg (UJ). “The team spent a lot of time working on the design and learnt a lot from one another during the process as we all had different talents,” said Selepe. “Working with IBM will expose us to different elements of engineering and help improve our prototype,” he said. Prizes for the winning team included R5 000 to implement the project and 15 sensor kits to get started. The main prize for the competition was 60 hours of mentorship from IBM. The team is hoping for the sensors to be installed in informal settlements by September.